The Division of Prevention and Rehabilitation at the Ottawa Heart Institute is home to a variety of evidence-based wellness programs, inpatient and outpatient cardiac rehabilitation, the widely adopted Ottawa Model for Smoking Cessation and an active research program. On May 1, 2017, Thais Coutinho, MD, took over leadership of Prevention and Rehabilitation, making her the first ever woman to hold the position of Division Chief at the Institute. Dr. Coutinho will also serve as Chair of the Heart Institute’s Canadian Women’s Heart Health Centre. She succeeds Andrew Pipe, MD, who led the Division for 11 years and will remain with the team as a physician and principle investigator. Dr. Coutinho sat down with The Beat to discuss her interests in the field and plans for the next five years. 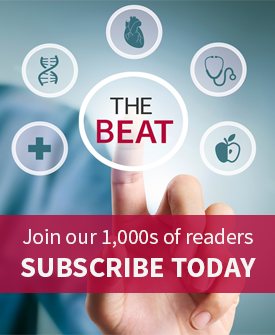 The Beat: As a cardiologist with a background in vascular health and biology, is moving into prevention and rehabilitation something you had previously envisioned for yourself? Dr. Coutinho: Absolutely. During my training, that was the area where I spent most of my time, and clinically it’s always been an emphasis of mine. Cardiovascular disease is the second leading cause of death in Canada, but we know that about 80% of cases of cardiovascular disease could be prevented. This is why prevention efforts are so important. We can keep many people from getting sick in the first place, and preventing disease is much less costly than treating it. The Beat: What do you hope to accomplish as Chief of the Division? Dr. Coutinho: First of all, I want to continue fostering and growing the areas that have been so successful already. There are so many success stories in the Division, like the Ottawa Model for Smoking Cessation. I want to make sure that those successful programs are going to go forward and keep growing. In terms of new programs, I’m interested in bringing patients with peripheral arterial disease (PAD) into prevention and rehabilitation. These patients have the greatest burden of cardiovascular risk factors and, despite this, tend to have the worst control of those risk factors compared with, for example, patients with just coronary disease. In addition, they had a lot of difficulty walking because of pain in the legs, and as a result, they have a very poor quality of life. I’m hoping to either visit a center in the U.S. where they do specific PAD rehab or bring someone here to teach us, because we can’t just apply the same principles we use for heart patients to them. Their needs are different, and their exercise tolerance is much lower. We know we can help them, we just need to figure out the best ways to do that. The other group that I want to focus on is women. Our rate of enrolment in rehabilitation here at the Heart Institute for women is 20%, 25% if we’re lucky. That’s not unique to us—if you look at the reports from other centres, it’s similar. So, we know that women are not enrolling. What we want to do is find out why, so we can address those reasons. Once we have that knowledge, we can come up with a system to either convince them to join or, if it’s a matter of programs that they need and we don’t offer, then we can start to offer those. With the Women’s Heart Health Centre, we have such an amazing resource, and we also hope to continue expanding our prevention services through it. For example, women who experience preeclampsia during pregnancy have anywhere between two to five times higher risk of having a heart attack or stroke down the road compared to women who didn’t, depending on the severity of the preeclampsia. And these events occur early: the average age for their first heart attack or stroke is 38. But these women traditionally don’t enrol in cardiovascular prevention programs. A lot of them—and a lot of their doctors—don’t even know about their risk. We hope we can start to fill in these gaps as well. The Beat: How do you see research in prevention and rehabilitation moving forward in the Division? Dr. Coutinho: That’s a key part of everything we do. That’s how we get better, and that’s how we come up with new therapies for patients. The Ottawa Model started out as a research project, and now it’s a huge clinical program that has changed clinical practice throughout the province and the country. So we definitely want to continue fostering research. My specific research interests are in assessments of vascular health. I think that there is potential to use non-invasive vascular assessments in the clinic to refine risk stratification, which is something we’re not doing now. We also want to focus on women from a research perspective. Following the first Canadian Women’s Heart Health Summit, a national research network has been formed with the help of the Heart and Stroke Foundation. We look forward to partnering with them so we can have a larger impact on women’s health. The Beat: What has been your impression of the Division so far? Dr. Coutinho: It’s been a delight to be able to walk into a Division like this, which has been so incredibly successful already. Over the last 11 years, Dr. Pipe has taken a Division that was already great and made it amazing. I can say without reservations that this is the best prevention and rehabilitation centre in the country. In a way, it makes my job harder because now I have to take this huge success and make sure it continues to snowball. But based on the people that I encounter daily—everyone here loves what they do—I have no question it will remain a huge success, and we will continue to improve the cardiovascular health of our community.